Before you frown at the thought of biting into a bitter Brussels sprout, try these exquisitely seasoned sprouts. Seasoned with aromatic Harissa Spice Blend and coconut oil, these roasted sprouts are a mouth-watering surprise with almost caramelized bottoms and crispy on-the-outside, tender on-the-inside texture. Don’t miss the seven alternative ways to season and/or dip ’em at the end of this recipe! Crispy Brussels Sprouts and Seven Ways to Love ‘Em! I tell my patients not to use black pepper as it is a gastric irritant. Preheat oven to 400F and line a large baking sheet with parchment paper. With a paring knife, trim off the ends of the sprouts and slice in half lengthwise. Remove any loose outer leaves. Place the prepped sprouts into a large bowl. Add the sunflower oil onto the sprouts in the bowl and stir or toss with hands until thoroughly coated. Add the Harissa blend spices that are beneficial for you and salt. Stir until combined. Spread the Brussels sprouts onto the prepared baking sheet in a uniform layer . Roast the sprouts for 20 minutes, then flip with spatula, and continue roasting for another 5-15 minutes until browned to your liking. 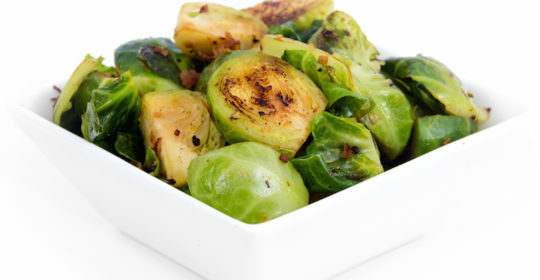 If you prefer very crisp sprouts, you can “overcook” these until very brown, but not blackened. Smaller sprouts will brown faster than larger ones. Drizzle with olive oil and quickly toss to coat. This infuses with flavor and moistens them a bit after roasting. Taste and add another tiny pinch of salt, if desired, and serve immediately – the hotter the better. Come talk to us about your diet. Book your appointment today!